On the 12th of April 1961 Russian cosmonaut Yuri Gagarin became the first man to fly into space. Since 1962, this day has been known in Russia and some former Soviet countries as Cosmonautics day. Last week, concurrently with the 52th anniversary of the event, space was one of the most talked-about themes in Russian and foreign media. The Washington Post published an article about Russian president Vladimir Putin’s visit to the new space centre Vostochny. The centre is situated in the Russian Far East and is supposed to reduce the country’s dependence on the Baikonur Cosmodrome in Kazakhstan. According to Putin, the first launches from the Vostochny centre are planned for 2015, while manned space flights will start to operate in 2018. According to The Washington Post, “Russia has a lease deal to use Baikonur until 2050 for an annual fee of $115 million. 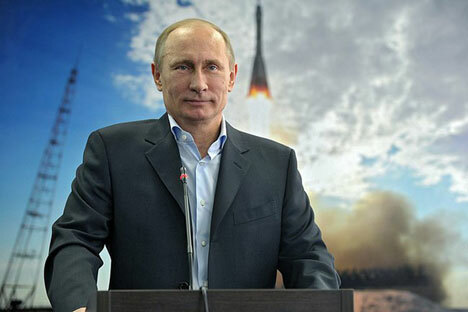 Amid tensions over fees payments, a Russian official said in February that Russia may suspend its lease for some facilities at Baikonur.” Putin, however, dispelled the rumors during his visit, when he remarked that Russia will continue to use the Baikonur Cosmodrome for the time being. On April 11, the Nasa official website published information on the possible discovery of Soviet Mars 3 hardware pieces dating back to 1971 on the surface of Mars. The theory was advanced by a group of Mars enthusiasts from Russia headed by Vitaly Egorov. “Vitali Egorov from St. Petersburg, Russia, heads the largest Russian Internet community about Curiosity. His subscribers did the preliminary search for Mars 3 via crowdsourcing. Egorov modeled what Mars 3 hardware pieces should look like in a HiRISE image, and the group carefully searched the many small features in this large image, finding what appear to be viable candidates in the southern part of the scene. Each candidate has a size and shape consistent with the expected hardware, and they are arranged on the surface as expected from the entry, descent and landing sequence,” Nasa reported. Space wasn’t the only topic of the week - fashion and ballet also dominated the news. Russian top-model Natalia Vodianova was honored by the Diller - von Furstenberg Family Foundation with an award for courage and leadership during an annual DFV Award. Natalia is a very successful model, and she never forgot to give back to her country through her organisation Naked Hearts, which operates in Russia and builds playgrounds for children all over the country. It was the first time Vodianova’s charity work received recognition outside Russia. “I conduct most of my fundraising in the fashion industry. It’s very international, and we have a lot of events outside of Russia, and even those in Moscow or St. Petersburg bring international celebrities and performers,” she was quoted saying.